How are janitorial carts constructed and are they built to stand up to daily use in busy environments? 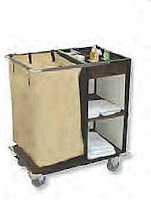 Maid carts, also known as janitorial carts, are designed be both practical as well as durable. They are typically made from aluminum that is both lightweight as well as being resistant to cosmetic damage, chemical spills and staining. Most carts will be painted to protect the metal and to provide a more aesthetically pleasing and neutral colored cart. The surface areas, including the durable metal frame or the plastic or poly shelves are all easily cleaned with any type of commercial disinfectant or cleaning solution. The surfaces are resistant to staining, discoloration, mold and mildew. Special casters are found on many of the top of the line maid carts. They will vary in size based the size of the cart and its overall design. Larger casters and wheels are designed to make moving the cart easy for people of all sizes and physical abilities. Many offer the option to lock the back two casters while continuing to allow the front two to swivel. This allows maximum control when moving the cart even through busy hallways and traffic areas. It also makes turning the cart when moving forwards very controlled without putting additional stress on the operator. Allowing all four wheels to swivel allows the cart to be pushed either forwards or backwards or straight to either side without the need to turn the cart. What ergonomic features are found in different janitorial carts to help staff? Ergonomic features that are designed to provide ease of use and operation for staff are found on most models of janitorial carts. One design addition is a push handle that keeps the operators hands and shoulders at a comfortable level. This prevents having to bend over to push or pull the cart. It also ensures maximum control over the movement of the cart in any direction including straight ahead and when cornering. Recessed bins on the top of the cart are designed to help staff store frequently used items in an easy to access area. No bending or squatting to get to the small items on the cart. Ledges that form the recessed part of the top shelf ensure that items are secure on the top shelf and will not roll off when the cart is moving. Adjustable shelving that doesn't require any tools to move the shelf also helps staff by allow customized configurations. This provides the option to keep everything together on one shelf for any given cleaning task. Locking brakes that can be adjusted with a tap of the foot to either engage or disengage prevent bending over to use or release the brake or having to hold onto the cart to keep it from moving. Staff can quickly engage the brakes whenever the cart is not in motion, providing an additional safety feature. How are janitorial carts different than utility carts and which is better for housekeeping services to use? Both maid carts and utility carts are very handy to have within a facility. However, a utility cart is not designed specifically with janitorial services in mind. It is more of an all-purpose cart that can be used to move items and materials for all shapes and sizes. Utility carts tend to be open on all sides and most do not have adjustable shelves, although various models may offer some options for customization. Carts specifically for housekeeping services have features that are designed to store and transport all types of cleaning supplies. They usually have either a trash bag system or a soiled linen bin in the cart, something that is never found in a utility cart. While both terms are often used interchangeably, there is a difference between the two options. Both are ideal for specific tasks but a janitorial cart is most recommended for housekeeping services.